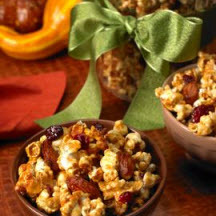 This orange-flavored caramel corn, studded with dried cranberries and crunchy almonds, is the perfect sweet treat for fall and winter parties. Place popcorn, cranberries and almonds in a large bowl; set aside. In a medium saucepan heat butter, brown sugar, corn syrup and orange juice concentrate over medium heat until butter is melted. Bring to a boil and boil 2 minutes. Remove from heat. Stir in extract and baking soda (mixture will foam). Bake 30 minutes, stirring twice during baking time. Stir caramel corn as it cools on baking sheet. Makes 2 1/2 quarts; 10 (1 cup) servings.